HE WEEKEND BEFORE LAST saw the annual pilgrimage from the Maternal Heart of Mary Church to the shrine of St Mary of the Cross in North Sydney. They set off at about 12 noon aiming to arrive at the tomb of the saint for Vespers at about 5pm. There’s lots of historic sandstone, rosaries, banners, hymns and a walk across the Sydney Harbour Bridge, then the final climb up Mount St to the Memorial Chapel. God willing I’ll be there next year. St Mary of the Cross is better known as Mary MacKillop, Australia’s first canonised saint. 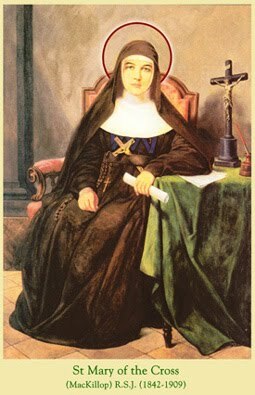 She founded the Sisters of St Joseph of the Sacred Heart and set up schools for poor children. And here is the hymn. Written by Rev. Fr. Dominic Popplewell of FSSP Canberra. the daughters of a noble line. to seek the pearl of hidden store. his Heart to please made all her bent. her spirit, all unladen, soared. her plighted faith, true love estrange. pray him for us, grace to afford. amid the stars, his mercy send. be praise and glory without end. It is suggested to be sung to the tune Jesu corona virginum (here written out in full for easy singing). In case 10 stanzas is a little long, here is a four verse hymn I prepared earlier. &ast; or “gain by thy merits and thy prayer.” as you prefer.